Bishop Claire S. Burkat reflects on Mary’s visit with Elizabeth, a Spirit-filled encounter that may have allowed the realization of God’s great promise and fulfillment that was visited upon Mary begin to really sink in. “God did not promise Mary an easy life, a trouble free heart, an unburdened mind…but God promised her a life worth living, a purpose that will continue to bless generation upon generation,” the bishop writes. And that promise extends to all of us, even if future generations don’t remember our names. “A truly blessed life is a life worth living, a life with great purpose, a life that leaves our world a better place,” the bishop writes. Two thousand years ago, two women had a Spirit-filled encounter, one very young and the other quite old. 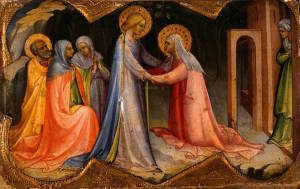 Perhaps in the months Mary visited with Elizabeth while they both nurtured their pregnancies, the realization of God’s great promise and fulfillment that was visited upon her began to really sink in. And we are glad with Mary. Her joy is contagious, her hopes high; she has begun to live into the purpose for which she was chosen. We know Mary will not have it easy. She will rejoice in the birth of her son, but she will also witness his cruel, humiliating and untimely death. God did not promise Mary an easy life, a trouble-free heart, an unburdened mind…but God promised her a life worth living, a purpose that will continue to bless generation upon generation, well after we are gone also. We have called Mary blessed because she faithfully answered when God called. We have called her blessed because she courageously allowed herself to be used for God’s purposes. We have called her blessed because she did her part in bringing God’s salvation and incarnation to us, and to the world. Today we tend to think of people being blessed for what they have… good health, a comfortable income, a loving family, a good job, a nice home, a new car. Yet a truly blessed life is a life worth living, a life with great purpose, a life that leaves our world a better place. God gave Mary a mighty purpose and Christ offers this abundant life to us as well. We are all blessed with opportunities and abilities and charisms to heal and change the world. Especially now, in these cynical times, your joy is needed, your purpose is important, your love for Christ and care for people is crucial for making a difference by sharing the spiritual gifts of mercy and justice and healing and love in tangible ways. Generations may not recall our names, but Christ remembers — and blesses us with a great purpose and a life worth living.